Warby Parker, known for its hipster styled eyeglasses and unique online shopping model, also is a great example of a corporation acting on its social responsibility. The company recently announced that it has sold – and also distributed free of charge – 1,000,000 pairs of eyeglasses through its one-for-one model. The model is similar to that of TOMS Shoes, which donates a pair of shoes to those in need for every pair sold to consumers. Warby Parker partner in the venture is nonprofit VisionSpring. Based on the number of glasses sold each month, Warby Parker makes the equivalent monetary donation to partners such as VisionSpring, who then trains local residents on how to administer eye exams and sell low-cost eyewear to the community. 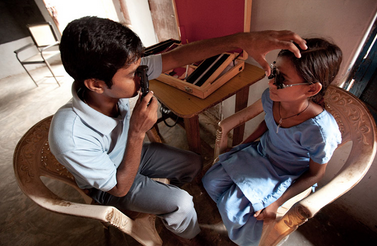 VisionSpring focuses on the impact that vision and glasses have on society. The organization estimates that 90% of those living with uncorrected vision are in the developing world and that glasses have the potential to increase productivity by 35% and increase monthly income by 20%. That’s a bottom line we would all like to see. Discuss the business model used by Warby Parker. Why is it successful? Also discuss corporate social responsibility and Warby Parker’s commitment to promoting good vision.